Many horse owners purchase an insurance policy to provide monetary coverage for a loss sustained to an equine under certain conditions. They also may buy a policy for coverage on large veterinary bills in the event of an illness to their horse companion, but what if there was a way to purchase a service to help protect your horse from injury, or speed up recovery time on an existing trauma? These are two examples of what massage therapy can provide to your horse. In the following article, I will explain the benefits and importance of equine massage, which plays a critical role in the healthy maintenance of the horse. A while back a client of mine said “I look at massage therapy for my horse as an insurance policy.” This really struck a cord with me, because not only am I a registered equine massage therapist, I am also an active licensed insurance agent. I have seen insurance clients get back to where they were before a loss because of their insurance policy, and they were grateful they purchased the policy in the first place. What my client said made perfect sense; she uses massage therapy as another way to cover the possibility of an injury or loss to her horse, similar to the way one would purchase an insurance contract to protect a loss to their home. 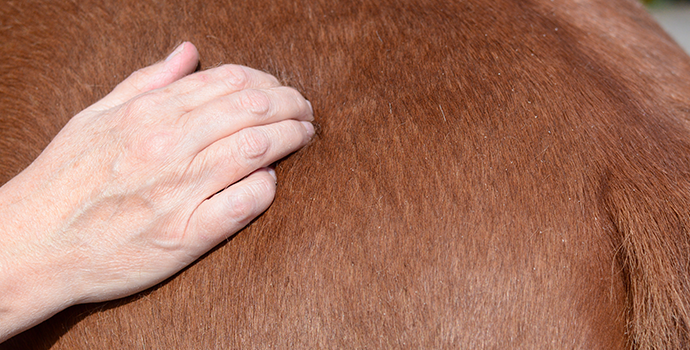 Massage therapy for the equine helps prevent injuries in many ways. It can improve and maintain blood supply and range of motion to the joints, along with softening tissue structures. Massage may also increase muscle tone and decrease tension. With these benefits, the horse is less likely to sustain an injury, versus if the horse is tense with poor circulation, he or she would be more prone to a soft tissue tear or strain. Another benefit of massage for the horse is to shorten recovery time from an injury, which as we all know can be lengthy depending on the severity. Massage will decrease inflammation and swelling, and because of its increased circulation effects, it will improve bone healing. Massage will also increase relaxation and a general sense of well-being, which will help the horse stay calm during the healing process. Further, massage will decrease pain, and reduce scar tissue, all of which will keep the horse more comfortable and lessen the amount of time he or she will need to be on stall rest or off of the regular work schedule. Equine massage therapy aids the health of the horse because certain techniques will slow and strengthen the heartbeat, allowing the heart to work more efficiently and help reduce blood pressure. Massage will loosen mucus in the lungs, increase function of the endocrine glands, and assist digestive function by reducing abdominal congestion and increasing nutrients to the digestive tract (think less likely to colic)! Protecting your horse is of great importance to horse owners, and we go to great lengths to make certain they are happy and comfortable. Massage therapy for your equine is another way to “insure” the longevity of your horse's life by preventing injury, speeding up recovery time from an injury and maintaining good health. (Always keep in mind that equine massage therapy is not a replacement for regular veterinary care). ® 2019 Terry Naturally Animal Health All Rights Reserved.